Two new lighting products from Paul C. Buff Inc. - a high efficiency "Retro Laser" reflector and a miniature "Baby Boomer" offset arm. 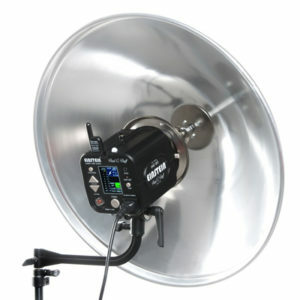 Two new lighting products from Paul C. Buff Inc. – a reflector and a miniature boom arm. The 22″ (56cm) high efficiency “Retro Laser Reflector“, previously codenamed “Luap Supreme”, is now available. The price is US$84.95. The Retro Laser™ Reflector is a highly efficient bounce reflector providing a long throw of light with excellent coverage. For sports photographers and other applications where a long throw is desirable, the shallow 22-inch diameter reflector produces a bright, narrow beam of light with even illumination and near 100% focused light transfer. In contrast to our 11-inch Long Throw Sports Reflector (11LTR) with a hot center and feathered falloff, the Retro Laser™ produces a flat area of coverage with sharp falloff outside of the illumination field and is up to 1f brighter at an equivalent beam width. With the Einstein™ E640 unit at full power (640 Ws), the Retro Laser™ delivers an incredible f/16 at 40 feet (ISO 100). The high output allows you to lower the output on your flash for faster flash durations as well. On the way: “Baby Boomer” offset arm, designed to enable downwards tilt of lighting modifiers on light stands. Price tipped at US$14.95. 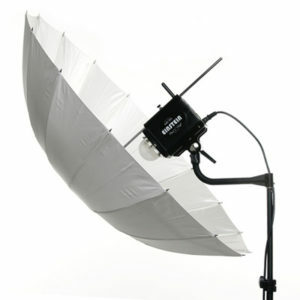 With the direct, top-mounting of standard light stands, positioning is limited by the size of the flash and the attached accessories – particularly restricted to a small range of angle adjustments when large accessories are present. The Baby Boomer™ eliminates these frustrations by offering a wide range of motion for your flash, especially useful with large accessories such as the Retro Laser™ Reflector, the Beauty Dishes and the PLM™ System. Whereas standard, upright mounting allows only a few degrees of adjustment, the Baby Boomer™ provides clearance from the stand so that your flash unit and accessories can be angled and titled over a much broader range, allowing extreme down-angle positioning.